It's not every day you see a Buddhist temple with a planetarium. Or with a giant space shuttle. Or a dinosaur. This isn't your everyday Buddhist temple. In Japan, Buddhist temples typically perform, among other things, last rites and funerals. They are usually solemn places, but not always. Take Shouganji, a four hundred year-old temple in Tokyo, for example. Apparently, it is the only Buddhist temple in the world with a planetarium on its grounds. Recently, Japanese site IT Media visited the temple to check it out. 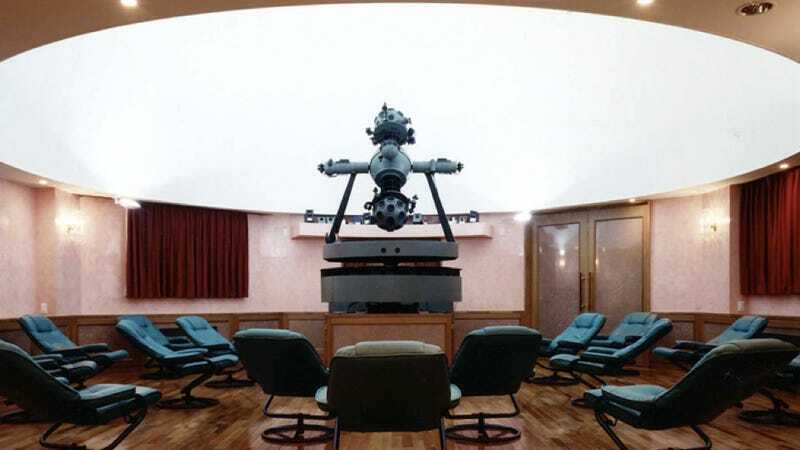 An astronomical observatory was built on the temple's grounds in 1989, followed in 1996 by a planetarium, called "Gingaza" (銀河座) or "Planetarium Theater Galaxy" in English. Able to seat twenty-two visitors, the planetarium is open to the general public twice a month for showings. It's not located in the main hall (see above), but in a separate structure. The individual behind the planetarium is the temple's chief Buddhist priest, Ryo Kasuga, who's long been interested in astronomy and presides over the planetarium. Kasuga is, as Naver points out, an unusual character: He studied operatic singing in Europe and is apparently an excellent magician. Now, he cracks jokes while showing the cosmos. Visitors have remarked that the presentation is surprisingly humorous. Originally, Kasuga installed the observatory and planetarium near the main temple hall to explain Buddhist teachings. While even Japanese people find it peculiar that this is a Buddhist temple, it does make sense if you take into account, for example, Buddhist cosmology. For you planetarium nerds out there, what might make Planetarium Theater Galaxy really unique is that it's the only planetarium that uses the Pentax Cosmostar No. 0, a prototype optical system it received from Pentax. If that doesn't do it, then you'll have to be satisfied with the Buddhist temple, the space shuttle, or the styracosaurus. Planetarium Theater Galaxy is a member of the Japan Planetarium Association.